Exchange 2007 End of Life. It’s time to migrate! 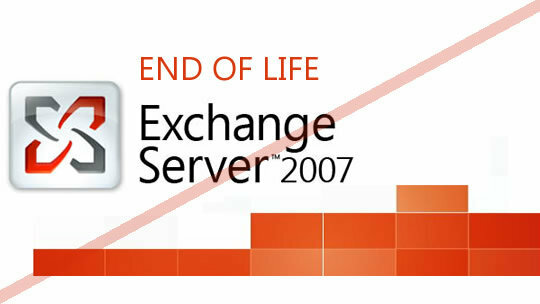 On 11, April 2017, Exchange Server 2007 reached End of Life. If you haven’t taken advantage of this opportunity to move to Office 365, now is the time! Anyone still on Exchange 2007 is at risk. Need to migrate now? Why not take advantage of this opportunity? What does End of Life mean? Your installation of Exchange 2007 will continue to run after this date. However, because of the changes listed above, we strongly recommend that you migrate from Exchange 2007 as soon as possible. Migrate your Exchange 2007 servers to a newer version of Exchange on your on-premises servers. Migration assistance with Office 365 – call our expert team on 1300 755 615 or email helpdesk@keycomm.com.au. While we strongly believe that you can achieve the best value and user experience by migrating to Office 365, we also understand that some organizations need to keep their email on-premises. This could be because of regulatory requirements, to guarantee data isn’t stored in a data center located in another country, and so on. If you choose to keep your email on-premises, you can migrate your Exchange 2007 environment to Exchange 2010, Exchange 2013, or Exchange 2016. We recommend that you migrate to Exchange 2016 if you can’t migrate to Office 365. Exchange 2016 includes all the features and advancements included with previous releases of Exchange, and it most closely matches the experience available with Office 365 (although some features are available only in Office 365). If you’re migrating to Office 365 or Exchange 2016, give us a call on 1300 755 615 and talk to our I.T expert team for our services. …and How your business is marketed. Have a quick question about the new Office 365? To stay up to date with the latest articles connect with us directly on LinkedIn and Google+. BEFORE WE CAN HELP, WE NEED TO HEAR FROM YOU! Perscribe a plan for consolidating and simplifying your services? Deliver a strategy for modernizing your business services? Recommend an agile and accessible approach for improving efficencies?